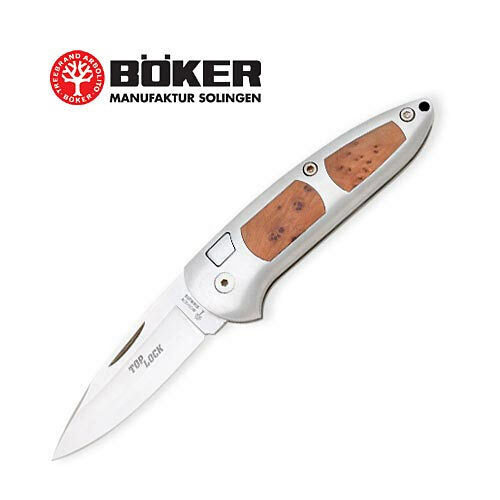 Boker Thuya Wood Top Lock Folding Knife | BUDK.com - Knives & Swords At The Lowest Prices! The Top Lock is one of Boker's most successful designs, ever! The push-button safety locks the blade firmly in either the open or closed position. This makes handling the TOP LOCK even safer and stronger. Accidental opening of the blade is practically impossible. In both sizes, the handle bodies are made of aluminum to keep the weight to a minimum. Blade with fine matte surface finish and smooth edge. Satin finished handle with precious Thuya wood inserts. Closed length 4 3/4" Blade 3 3/8".